Easy and Fast interface solution for every Customer Age range. Fast product selection and renting process. You handle your payout. We have a great Partnership with one of the most modern and biggest payment solutions Worldwide. The use of Promotion codes, Monthly subscription, multi use cards, can change to business and increase significantly the revenue. Create your own products, events or courses. Manage your clients and stay in contact for future promotions. Out entire web is responsive and will adapt on any of your devices so you have the control where ever you need it. Every booking, payment, renting hour is visible in real time from where ever you need it, so you have full control over what happens on your Station. Keep the contact with your customers, offer them discounts and inform them about your special events and sports courses. We don't like to handle money that don't belong to us, for that we have strong partners that transfer the money straight and safe to your account. Keep control over all your employees and manage from the office. After a long research and the lack of suitable solutions we decided to make our own software to run and manage our Stand up paddle renting stations here in Zürich. We created a simple and easy to use iPad app to make sales as easy as possible. 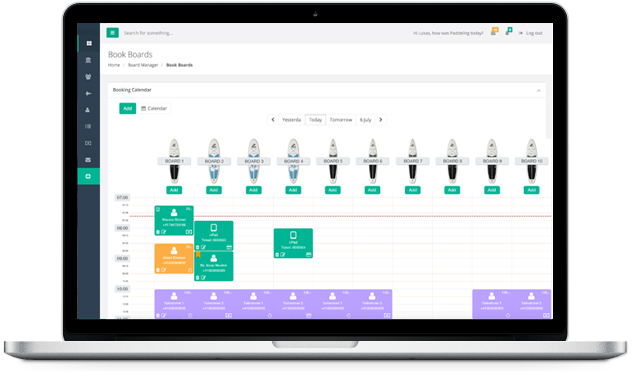 With our Build in Crashcourse option you are able to control if you want a fully automatic station or introduce every customer by giving a Crashcourse. We are small, but highly experienced both in the Stand up paddle renting Business and in technological solutions. There is no better marketing then a happy customer. 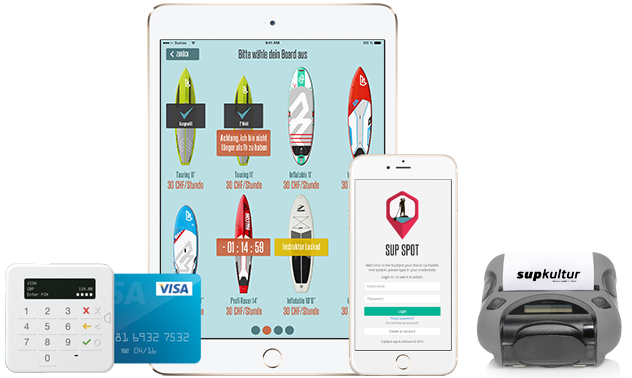 "SupSpot has done an outstanding job in automatizing the renting process of Stand up Paddles and we are happy and excited to be part of it from the first day on." "What a great idea, the iPad Sales point solutions is revolutionary and world wide first of its kind for Stand up Paddles. We are proud to Partner up with SupSpot to bring this to even more people." "We developed together with SupSpot, and can proudly say, it's a game changer for renting Stand up Paddles & Manage the renting Business. Key to run our stations and with lot's of added value for our clients." In a few weeks we will be ready to offer our online booking to eighter clients or 3rd parties in order to make your business grow. So you can partner up with close by Businesses. We Manage courses, external 3rd party instructors such as Yoga and Pilates for example which can add their products and courses independently with no more efforts from the station owner. Our ticket system allows to partner up with 3rd party business around you to create great collaborations, discounts or Combi packs. Do you have a close by Hotel? Restaurant? Camping? Make them part of your business. You can create great combi packs such as your clients get a discount if they come out of this restaurant or make a consumption after renting with you. Offer discounts to close by hotels, give them access to your booking system to send your clients for a small fee. Specially in this business clients pass by very fast, the SupSpot app helps you not to lose contact with our clients and gives you easy options to control the product they bought. Incentive a client by offering him a returning discount or motivate clients at the beginning of a Season with a discount. Our business depends on Seasons, Weather, clients.. so we thought about a different way then a usual monthly fee. We want to be part of your business, for the good and for the bad. If you earn money so will we, if you don't we will not ask you for it. Pay for rented board as you go. 0 to 500 Rented Boards, this pricing table is made for smaller Stations and such that have the Stand up Board as a side product. 500 to 1500 Rented Boards, thought for the small to middle Stations owners up tho 10 boards. 1500 to 3000 Rented Boards, thought for the middle to bigger Stations owners up tho 20 boards. More then 3000 Rented Boards, this pricing is for the bigger stations with 20 boards+ and dedicated business. * In case you have more then one station please contact us for a multi station discount. This pricing can change if your are part our affiliation program or a Brand Ambassador, please check our affiliation program and be a part of our Business. 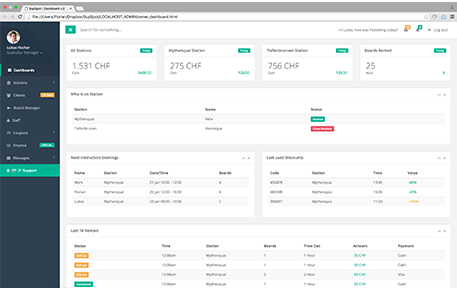 We are a Made in Switzerland Startup located in Zürich, Speak German, English, Spanish.. Contact us if you have any questions.